Ah Christmas, a time of happiness, generosity and general merriment. 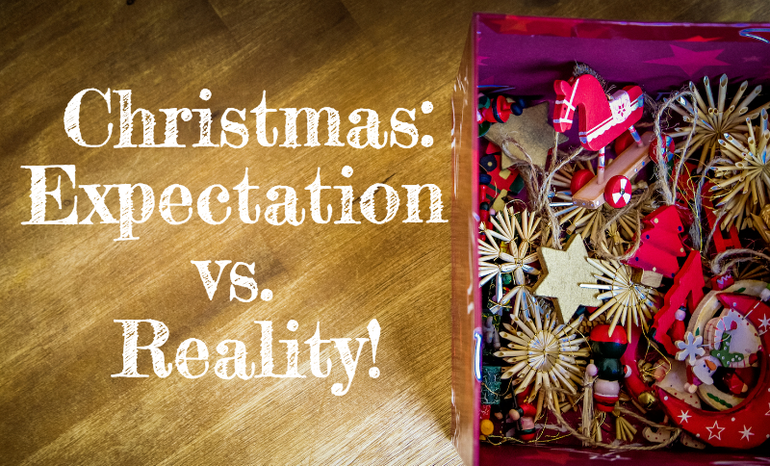 This season, the internet will be awash with blogs on the “Best Christmas Markets”, “The places you MUST visit” or the “Alternative Christmas traditions” so this year, we thought we’d take a tongue in cheek look at The Christmas Expectations vs. Realities, and we can almost guarantee you can relate to some of them! Below you’ll find 16 of the most exciting things about Christmas, but with a swift click or swipe to the right, you’ll reveal the reality to the expectation. The bitter, bitter disappointment you feel, whilst trying to keep up the "Thanks, this is just what I wanted" act. Until you end up mucking up your timings and burning the bird. Ooops! ...Only in the movies. This is more like it. "This year, I'm going all out and putting lights everywhere. It will be my very own Grotto!" We all have our favourites and are filled with glee when we first hear them on the radio! Ah the novelty Christmas Jumper! They always seem like such a great idea! Novelty wears pretty thin, pretty quickly; you just get itchy and hot! Christmas is the best time to get the whole family together; what better than spending the most festive day of the year with the whole gang? We say it every year... "Christmas Shopping starts in September!" But we feel more like this... 9am is a perfectly acceptable time to get up, thanks! Surely when you purchase such beautifully crafted Christmas crackers, you're sure to receive a ruddy good prize inside? Why do we feel our just ends up looking like this in comparison? Poor effort guys, really poor. The build up, the anticipation, the look of wonder in children's eyes when you tell them Father Christmas will be stopping by! Oh, the Lynx set one was a sore subject in the office having happened one too many times to the poor guys..! Do you have a funny Christmas experience to share? We’d love to hear your stories in the comments below. Photo credits go to Moni’cam for the drive home, Alishav for the Christmas lights and newkidfish for the crackers. Extra credit goes to the APS team for being fantastic sports and being part of this, too!